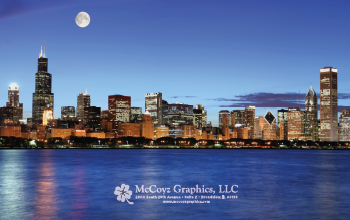 McCoyz Graphics, LLC is a company that has evolved from true partnerships & relationships over the past 25 years. In the past 10 years McCoyz Graphics has expanded our manufacturing facility from 10,000 square feet to just under 20,000 square feet. We are located in Broadview, IL. Our plant is less than 15 miles from either of Chicago Airports, Midway (MDW) or O'Hare (ORD). Our employee management base, from production coordinating to manufacturing, has a total combined experience of over 100 years in printing and card manufacturing.